Yesterday, I got the last parking space in Swingate. Today I wasn’t so lucky. The barrier let me in but I was like a forlorn 7-year-old realising this game of musical chairs was over for me (though it didn’t stop the naughty red Focus behind me park in the illegal non-space). Anyway, so on to Danesgate it was. Slightly further away from the station and the detour means I’d miss my train, but no matter. I haven't seen this dog. So I wondered if they’d had any joy. And on closer inspection there was a web address at the bottom of the poster, partially obscured by a drawing pin. A quick Google and I’d found AlfiesLostDogs.com. It’s a site that aims to help people find missing dogs. Give them the details and they’ll put them into a template and send you flyers back so you can post them up in your area. You can moan all you like about the art direction and typography (if you’re that way inclined) but there’s no denying Alfie (or rather Justine, his owner) has got his heart in the right place. The site also acts as a central database that puts people who’ve found dogs in touch with people who’ve lost them. Another quick search turned up Fergus’s entry and the accompanying messages of goodwill. Well dear reader, it doesn’t end well. Following the forum thread, Fergus’s body was found a few weeks after he went missing. He was by the side of the road, not far from where he was last seen. Touchingly, it seems he was heading back in the direction of his home but didn’t quite make it. The web eh? A force for good, for community, for finding out that a random missing dog has gone to the big kennel in the sky. This post is dedicated to the memory of Fergus the Scottish terrier. My mate Ban Ki Moon. 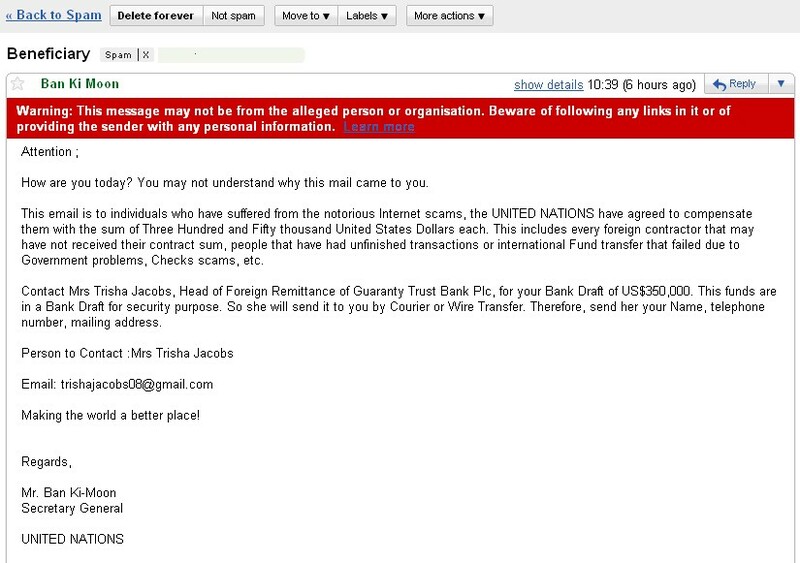 Got an email from the Secretary General at the United Nations today. So cool. He’s advised me that if I’ve been a victim of Internet fraud I can claim $350,000 in compensation; all I have to do is send him my details. As luck would have it, so far I haven’t been caught out by elaborate email scams, but I reckon I could tell a little white lie and claim the cash! Big news from stevenage-town-centre.co.uk: Gok Wan is not coming to town. Unfortunately, Stevenage has not been successful in persuading Channel 4 to film an episode of Gok Wan’s Fashion Fix in Stevenage town centre. However, the Stevenage Town Centre Management Company hope to team up with a hair salon, spa, fashionwear retailer and fitness centre to offer one lucky lady the chance to have the ultimate makeover after all. Further details will follow in the next few weeks. Gok: not coming to Stevenage. Official. Maybe Stevenage was just a fashion fix too far. Some good news though: Santa is still scheduled to make a brief appearance on the night of December 24. I was a big fan of the Art of Noise when I was a teenager. I used to buy their latest 12″ and listen to it with the speakers facing each other and my head in the middle to get the most out of the stereo mix. For all their promise, they just about mustered enough material for a Greatest Hits album, but they were never quite as good as I wanted them to be. The Rhythm Scholar has taken it upon himself to take their greatest hits in microcosm and create a Deftly Diverted remix of Close To The Edit. It features all the signature samples from their repertoire and stays true to AoN’s anything-goes approach to mixing. Hats off to you, Mr Scholar. Rather than some faceless corporation taking your money to further their evil plans, it’s nice to be reminded that they employ real people, much like you and I. 3. He’s not employed by the rail company. So it’s always refreshing to hear someone real say something real. Due to over-running engineering works (possibly not helped by the snow) there were a few trains missing this morning. As luck would have it, an empty one pulled up unannounced and we all piled in. As there hadn’t been a train for a very long time, it was standing room only. Chuckles all round and slightly warmer feelings towards the nasty corporation that reluctantly pays the wages of the ‘man at the front’. 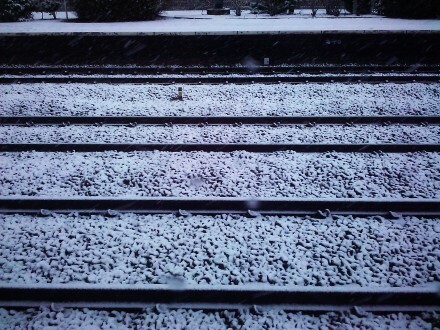 Snowy tracks at Welwyn Garden City this morning. Free milkshakes for a year. How to nearly win free milkshakes for a year. 1. Enter a competition on the local radio station to coincide with the launch of Make-A-Shake in Hitchin. 2. Come up with an original recipe for a brand new milkshake. 3. Call it the UFO (Unidentified Frozen Object). 5. Get through to the final 4 and the live on-air ‘slurp-off’. 6. Lose to the apple crumble-based ‘Crumble Me Up’ recipe. 7. 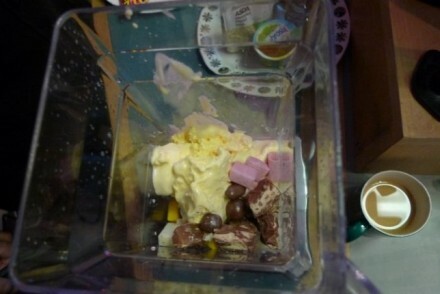 Have Make-A-Shake like the UFO enough to put it on the menu anyway. The ingredients (DJ's tea not included). Chris was unprepared for the UFO's sugary blitzkrieg. To be fair to First Capital Connect and East Coast, they are pretty reliable. The snows in December and January threw a huge spanner in the works. Emergency timetable. Fewer trains. Fewer carriages. 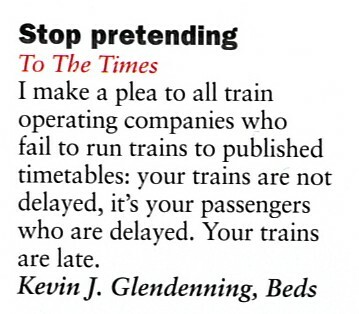 Sometimes I think if they were more upfront with the reasons why they’re struggling – in very specific terms – we as commuters might be able to sympathise and see that running a rail service isn’t a walk in the park. I’ve been meaning to do a post about a Sven Goran Eriksson lookalike on the train. I’ve seen him a few times and I’ve done a bit of Google stalking and discovered that a professional Sven-a-like lives in Welwyn Garden City, so it’s probably him. Not sure why he travels up as far as Stevenage in the evening. Maybe he’s seeing an Ulrika lookalike on the sly. He does look impossibly like Sven though – he must get stopped ALL the time. 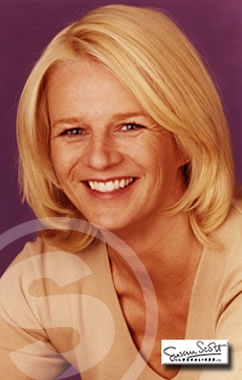 Ulrika-like: not necessarily having an affair.